Now that I am working, I can't help but breakout due to unknown reasons. Routine has always been the same. I'm asking myself, was it my makeup? Was it the pollution? What should we use to get rid of pimples as well as the acne marks altogether? Luckily there was one product I've been leaning on for a few weeks already. This has been given to me by Vida Nutri Science along with the soap I reviewed here. 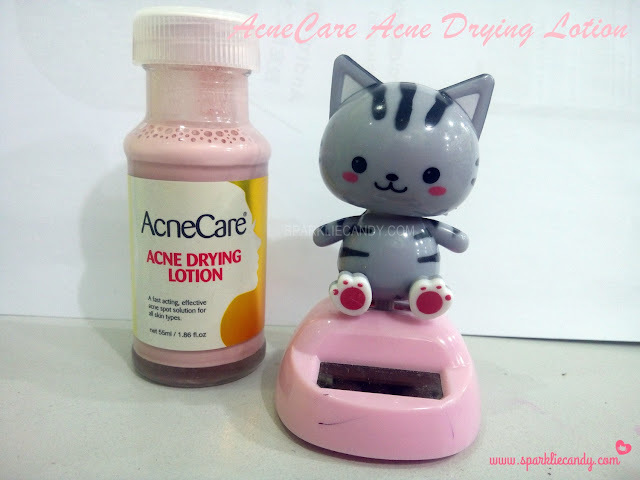 I was suppose to give this to a friend, the AcneCare Acne Drying Lotion. A fast acting effective acne spot solution for all skin types. How to use:Dab a cotton swab into pink sediment. Dab on affected area after cleansing of face and let it dry overnight. A fast acting, effective acne spot solution for all skin types. Wash off in the morning. I hope you won't be confused with the word lotion, the solution is liquid or sediment as they call it. The product is pink with alcohol smell, somehow chemical-ish to me. AcneCare Acne Drying Lotion is said to be similar to Mario Badescu Drying Lotion. I am only familiar with the salicylic acid, alochol. The other ingredients on the list is brand new to me. On one application there was no sting sensation on the acne compared to when I use acne gels loaded with tea tree oil and alcohol. The next day the acne is not so inflamed anymore .After 2-3 days of usage the spot treated with the Acnecare Acne Drying Lotion is already peeling, once it peeled it left no dark marks! With photo reference above. I had a recent breakout on the chin. With just one application, its less redness the next day. Product is sponsored by Vida Nutriscience. But this is sold at P199 for one bottle. Do not shake! Place the bottle on a table or something and let the layers separate. You will only need the concentrated pink sediment. I have other anti-acne prods to try so maybe next time. Yu Seung Woo is my new idol right there. Perfect soothing ballads which can make any girl's heart beat. Great post.. My skin is very sensitive So I am afraid of experimenting with my skin. From last one month I am applying Revitol Acnezine acne treatment cream on my skin. And I am quite happy with the results. It works for both adults & teenagers suffering from mild to moderate facial or body acne. ask lng po mas ok b ilagay s ref to pag hnd ginagamit and ano kaya mgnda mostiurizer gamitin? Sa akin sis.. Bumalik nnmn ang pimple ko.. Kkbili ko lng ng acne drying lotion.. Sna effective sya mwla..